The astonishing 2018 Ford Mustang is the new car capable of taking you further and faster! The newest version of the Mustang has been engineered with the most recent technologies. You are guaranteed to have a unique and enhanced driving experience! And guess what? You have the possibility to choose from a selection of 10 different trim levels ranging from the V6 Fastback, the EcoBoost®, Premium, Convertible to the Shelby® GT350R. Each model is even furthermore customizable to cater to your needs. Keep on reading to learn more about the particularities of this car. Even though the Mustangs are so small in size, they are actually as powerful as some larger vehicles. Thanks to turbocharging and direct injection the EcoBoost engines are capable of producing the performance of larger engines while still maintaining efficiency. This implies that so much power has been condensed in these small cars. The EcoBoost trim has an impressive fuel efficiency for those drivers who are concerned with the well-being of the environment. The Shelby GT350® and GT350R are the cars with the most powerful engines in this series and they are capable of producing 526 horsepower and 429 torque. With these cars, you will definitely be able to feel an instant adrenaline rush!! Don’t worry, even at these incredibly fast speeds, you will be safe! This new Mustang has been designed with an independent rear suspension system that helps you handle the car with more precision. The 2018 Mustang also has anti-squat and anti-lift systems to give you more control while accelerating or bringing your car to a stop. 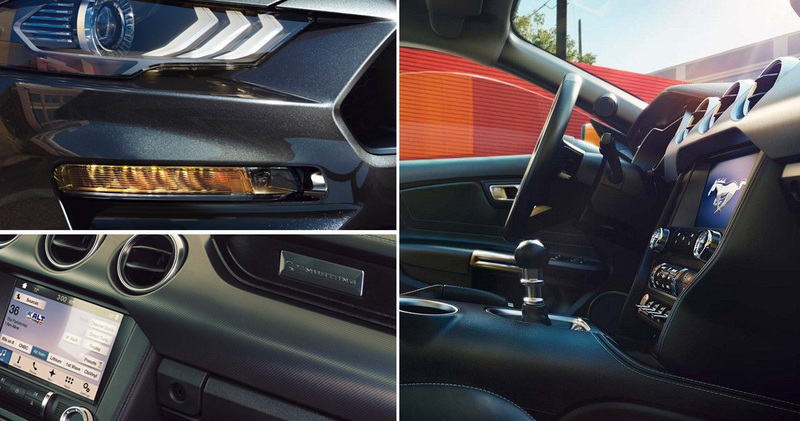 The 2018 Mustang has Safety Canopy side-curtain airbags in addition to the usual airbags at the front of the car for the safety of all passengers. You also have access to an SOS Post-Crash Alert System to request help in emergency situations. Through the years, Ford has developed a superior electronic stability system for increased maneuverability regardless of conditions. Gravel, snow, and rain are all in a days work for the Mustang. Furthermore, the cars are also equipped with a Blind Spot Information System to ensure you are aware of other vehicles that might be in your blind spot. Who likes having to wait for their windows to defrost before he/she can take off? Frankly, no one enjoys doing that. So that is why the 2018 Mustang has a rear-window defroster in order to make your takeoff smoother. 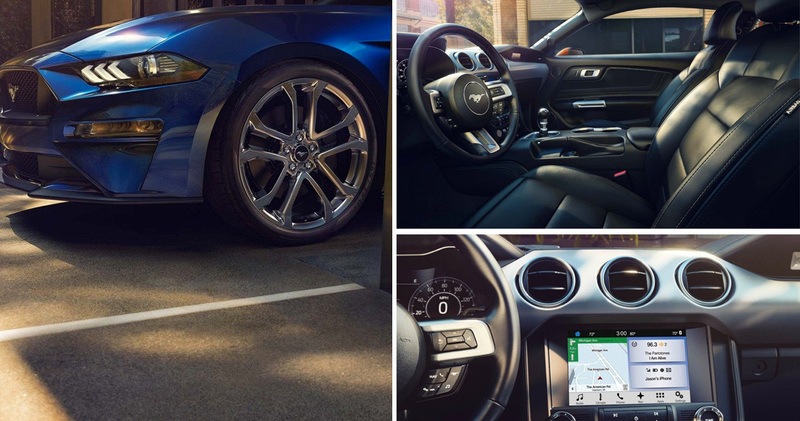 On the inside of this Mustang, there are many great features as well! The auto-dimming rearview mirror adjusts according to the lighting available. This enables you to always clearly see what’s behind you when you are driving. The rear-view camera also makes sure you are safe, it provides you a view of the things you might be unable to see through the rearview mirror. Still want some additional parts and accessories? There are several accessories available to help you further enhance the capabilities and look of your vehicle. Make sure to check out our dealership to see more parts and accessories!